Gary’s large charcoal drawings are very personal works of art. Each work contains a number of different stories layered over each other. The drawings are developed over a long period of time and relate to the artists life both directly and indirectly. In these drawings Gary explores everyday life with scenes that are on the one hand everyday but also which contain deep poignant moments of meaning and symbolism. In this work, ‘The Bill’s on mum!’, we see a man slouched on the sofa in front of the TV, the light from the TV lighting up the darkened room. Two children are in the room, one boy playing at the end of the sofa with an action figure whilst the other looks out through a half opened door, presumably calling his mother with the title of the work “The Bill’s on mum!”. Beyond the door is a bright light, perhaps she is still in the kitchen, but also in Gary’s layered meaning she is missing. As well as referring to the TV series, ‘The Bill’ we see through the window two policemen beating someone in the street outside, contrasting the TV reality with another story. Gary likes to bend the perspective of the picture giving us the feeling that we may be a “fly on the wall” looking down from above the wardrobe. Indeed many of these drawings feature flies or moths, themselves symbols. 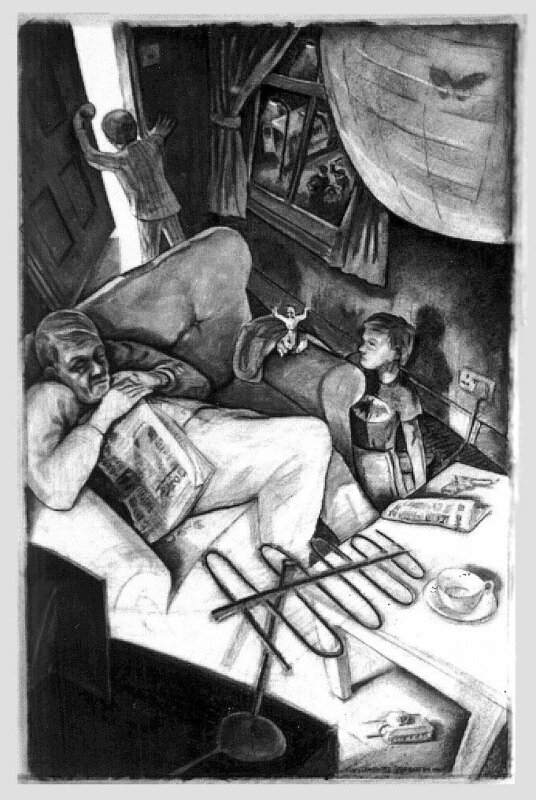 As in the other drawings in this series there is more than one story embedded in the work and the artist sees himself in the man and the boy and also in the moth trapped in the light shade.